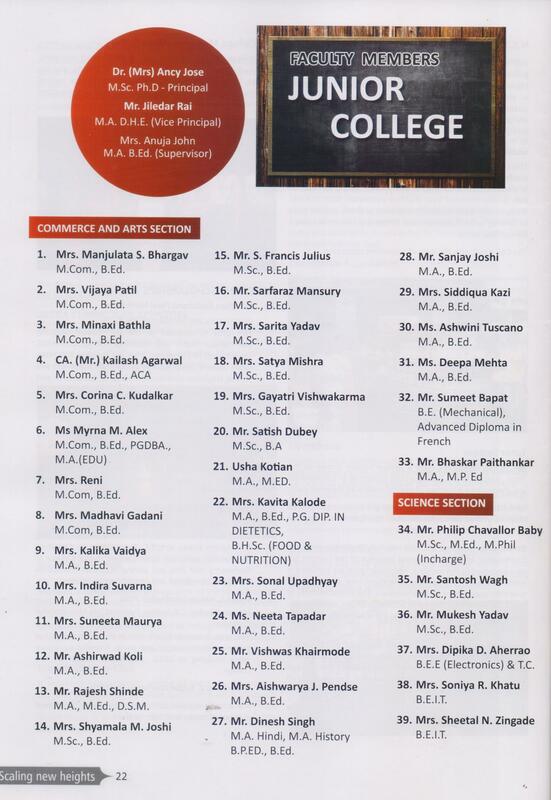 In 2002, the college opted voluntarily for assessment and evaluation by National Assessment and Accreditation Council (NAAC), an autonomous body of UGC and the college made a breakthrough in the fields of academics as it achieved the highest rating of Five Stars and by being the only Five Star accredited college in the western suburbs. We received the N.A.A.C. Accreditation at the hands of Dr. V.N. Rajasekharan Pillai, Director, N.A.A.C. We attribute this success to all the stake holders of our institution – our students, our teachers, our administrative staff and our management. The success of our institution lies in the hard work of each and every individual and their capability to function as a team. N.A.A.C. Peer Team Reaccreditation visit took place between 17.03.2008 and 19.03.2008. Result of the same was declared on 28.03.2008 in the 45th E.C. Meeting. Our college is reaccredited with A grade. We attribute this success to all the stake holders of our institution – our alumni and present students, their parents, our teachers, our administrative staff and our management. The success of our institution lies in the hard work of each and every individual and their capability to function as a team.